It’s not a debate. It’s not a right or wrong. It’s a preference. One that we talked about before and we don’t mind addressing again since it was recently in the news. Can you wash your jeans? Yes. Should you wash your jeans? Yes. How often? That will depend. This is where the personal preferences comes in. Jeans, a good pair of jeans, are one of the most durable pieces of clothing we own. They withstand a lot more usage and wear than anything else in our closet. A good number of folks wear jeans for work, however, most of us wear them casually and fashionably. 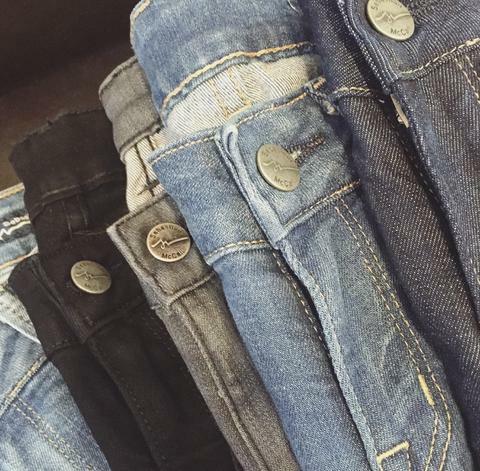 When we buy a pair of jeans, we want them to fit great and look nice. We want that perfect fit and look each time we wear them. Washing your jeans the right way will ensure that. To preserve the color of your jeans, wash them in cold water. Warm water causes darker dyes to bleed out more. Cold water ensures that darker or black colors last longer. You can even use detergents that are formulated to help keep darker colors dark. Also, wash your jeans inside out. This will help reduce color loss and protect the fabric and metal details of your jeans. Finally, don’t dry your jeans in a dryer. Hang them up to dry. Dryers can shrink jeans, fade colors, and distort the fit if they are weaved with fabrics other than cotton such as elastane or spandex. Some people think that drying jeans with get them back to their original shape and this is not always true. Merely washing them in cold water will help reshape the jeans. The question that remains is, how often should you wash your jeans? Most people can get away with washing their jeans after several uses. They aren’t really wearing their jeans for hard labor or strenuous activities. However, if you wear your jeans frequently and they are exposed to bacteria or are soiled with wear, wash them. You don’t want to risk smelling badly or giving yourself a rash. To minimize washing, hang your jeans after each wear. This gives them a chance to air out between uses and reduces any smells or germ buildup that can occur if not properly ventilated. Following the steps above will help prolong the life, the look, and the fit of your jeans.